It's got a D-pad and an OLED, but it's the basics that will win you over. The MM830’s noteworthy distinction is a built-in D-pad on the side. That’s a “Direction Pad,” for those of you who are so committed to mouse-and-keyboard you’ve somehow never picked up a gamepad and experienced the cross-shaped control that’s been a standard feature on console controllers going back to the original Nintendo Entertainment System. When Cooler Master says it’s put a D-pad on the MM830, I’m intrigued. What could you do with it? Could I play Super Mario Bros using just my mouse? Or can I even get the same utility from it that I get from a console D-pad, using it to hotkey certain tasks in-game? The reality is less interesting than it sounds. Cooler Master calls it a D-pad, but it’s really just four standard thumb buttons arranged to look (sort-of) like a D-pad. The buttons aren’t even connected in the middle, meaning you can’t easily rock between them. You’re definitely not going to have a good time playing Super Mario Bros with it. Corsair’s Scimitar. And it doesn’t even have that many buttons. Four on the side brings the MM830’s total to eight, which is less than the I-don’t-even-call-it-an-MMO-mouse Logitech G502 and its 11 buttons. Cooler Master’s software features a “Tactix” function that allows you to double-map every button except Left Click, but even then we’re talking 14 buttons tops. So the D-pad is more of a marketing gimmick than anything, unfortunately. It works as advertised, I guess, and you could in theory recreate the MM830’s D-pad layout for your favorite console port—for instance, in Far Cry New Dawn make it so “Up” on the MM830’s D-pad corresponds to pulling out your binoculars, the same as it would on a controller. It’s more of a novelty though. And it’s not the only novelty, even! In addition to the D-pad, the MM830 also has an OLED screen on the side. It’s not the first mouse to do so. See also: SteelSeries’s Rival 710 and the Swiftpoint Z. But down along the front-left side of the MM830, you’ll find a tiny little OLED display (see above image). Again, it’s mostly a gimmick. You can use it to display various system stats, e.g. RAM, CPU and GPU usage, volume. You can also upload your own 96x24-pixel monochrome artwork, or choose from some Cooler Master presets if you want (for instance) a black-and-white AK47 on the side of your mouse. Why, though? It’s a fun novelty, but rarely do I need to know my CPU or RAM usage so badly that I want it constantly scrolling across my mouse. Not to mention, the position’s so awkward you can’t even check it comfortably on-the-fly. I found I either had to tilt the mouse towards me or crane my neck down to look at it, which seems to defeat the purpose. That said, the MM830 is a great little mouse. Sure it’s ridden with gimmicks, but I really like the design. It’s extremely comfortable, with a gentle right-hand scoop and a thumb rest. The plastic on top also has a bit of texture to it—not enough you can see it, but an ultra-fine sandpaper feel that helps you keep a firm grip. 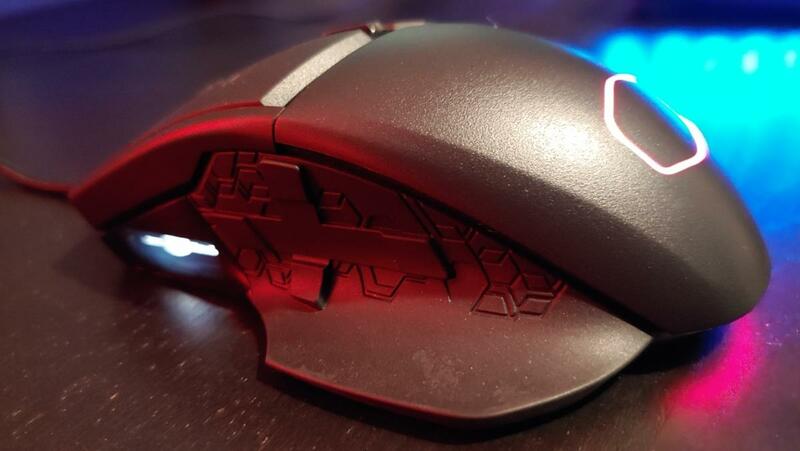 It should be durable as well, with Cooler Master calling out the MM830’s PBT chassis, a marked improvement over the cheaper plastics used in most mice. The branding is beautifully minimal, with Cooler Master opting to use the outline of its logo but not the actual words. 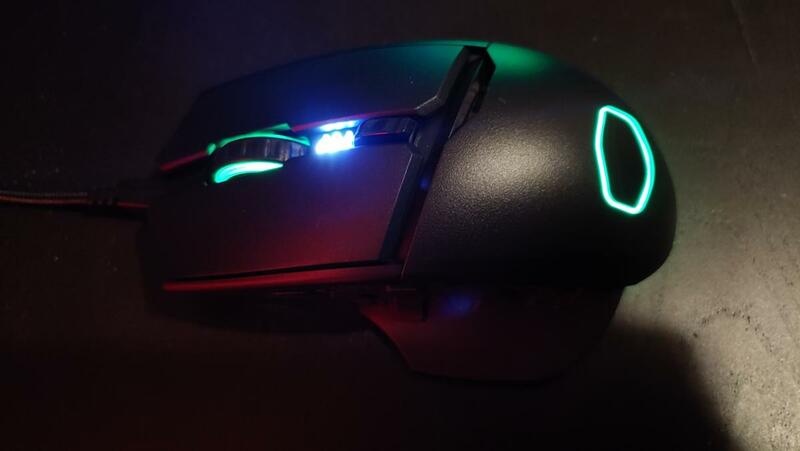 There’s just a glowing hexagon on the rear of the mouse, elegant and understated. And as you’d expect, the internals are on-par with the rest of the market nowadays. Cooler Master’s using the standard Pixart PMW3360 optical sensor in the MM830, though for some reason the maximum DPI’s been cranked from the usual 12,000 up to 24,000. Again, a gimmick. Are you sensing a pattern here? Most professional gamers use DPIs in the sub-2,000 range, to give you some context. Even if you have a 4K monitor and are concerned about navigating your desktop, you’re likely to end up around 5,000 DPI maximum. That would be considered “high sensitivity” for most people. 12,000 DPI was already a number no human would ever touch, and 24,000 DPI even more so. Regardless, the PMW3360 is still a top-tier sensor, and Cooler Master’s implementation is fine. 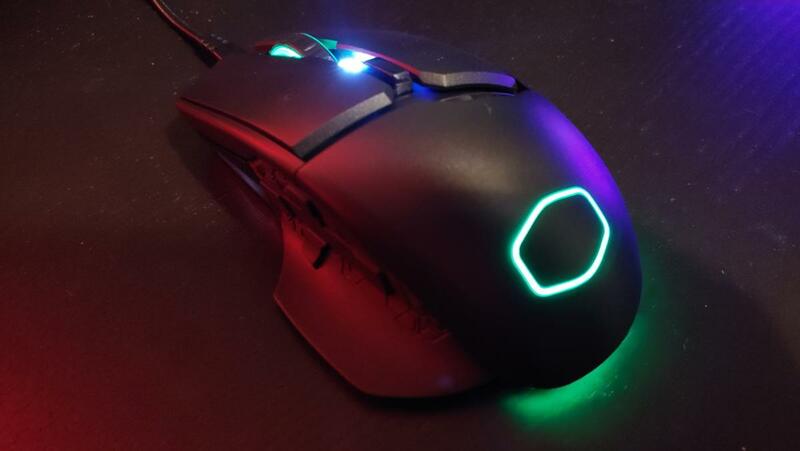 The mouse performs as well as any other modern gaming mouse. Just be aware that the numbers in this case are mostly to trick the uninformed. 24,000 DPI is “better” than 12,000 DPI only in the sense that a car with a max speed of 200 miles per hour is “better” than one that tops out at 190 miles per hour. Meanwhile all you do is drive to and from the office every day. Reading back over this review, it’d be easy to come away with a negative impression of the MM830. That’s not at all my intention. 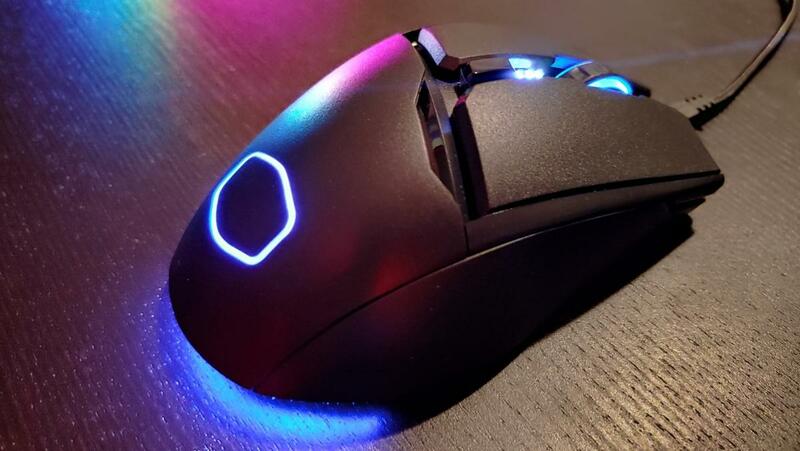 This is actually a great mouse, extremely comfortable, with all the basic features you’d want, and at a budget-friendly price. Cooler Master’s stuffed it full of gimmicks that add nothing of value to the MM830, but they don’t really need to. It’s a good mouse regardless, and the gimmicks just feel superfluous. Given that the price stayed reasonable, it’s hard to knock Cooler Master for trying something new. And besides, it’s more interesting this way. Sure, none of the MM830’s experiments are particularly noteworthy, nor worth copying. I’ll take bold-but-flawed over another unambitious DeathAdder clone any day though—especially when the fundamentals stay intact. Cooler Master's tried a bunch of experiments with the MM830, none of them that successful. And yet it's still, at its core, an excellent mouse at a more-than-fair price. Surprise!